Rev. Fr. 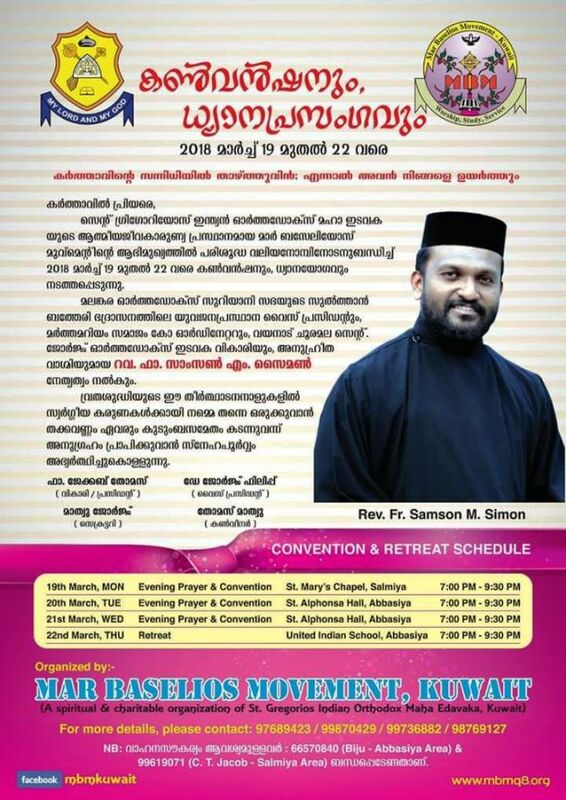 Samson M Simon has arrived in Kuwait on 15th March 2018 to lead Mar Baselios Movement Convention & Retreat. 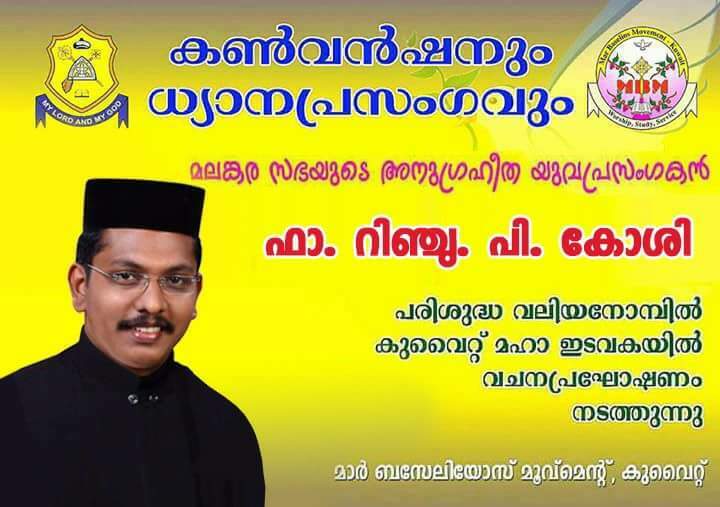 Hearty Welcome to Achan. Mar Baselios Movement is organizing a Convention and Retreat from 14th to 17th of March 2016, in connection with the Holy Great Lent. Rev. Fr. 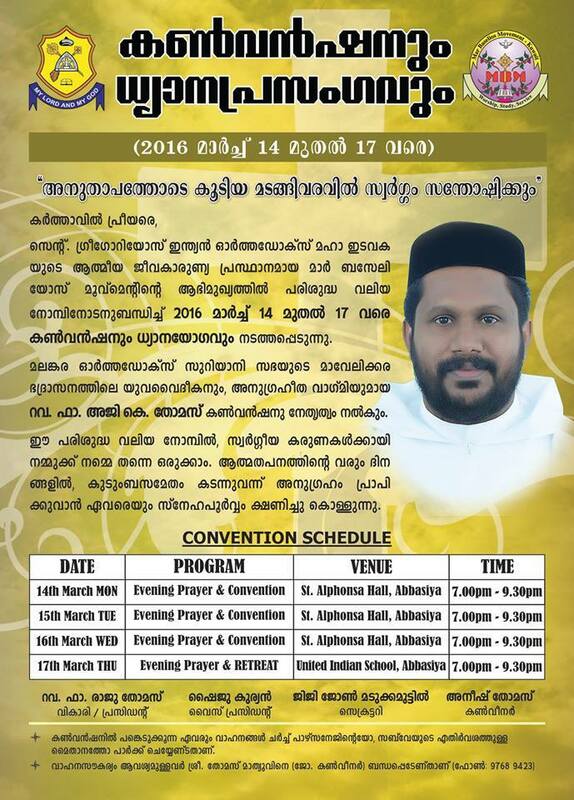 Aji K.Thomas (Vicar, Mar Baselios Church Vazhuvadi, Mavelikkara Diocese) will lead the Convention and Retreat. All Parish members are kindly requested to attend the Convention and Retreat. Parish extends a Warm and Hearty Welcome to Rev. Fr. Aji K.Thomas. Designation Name Mobile No. Resi. No. Prayer Group Committee Member Mobile No. Resi. No. 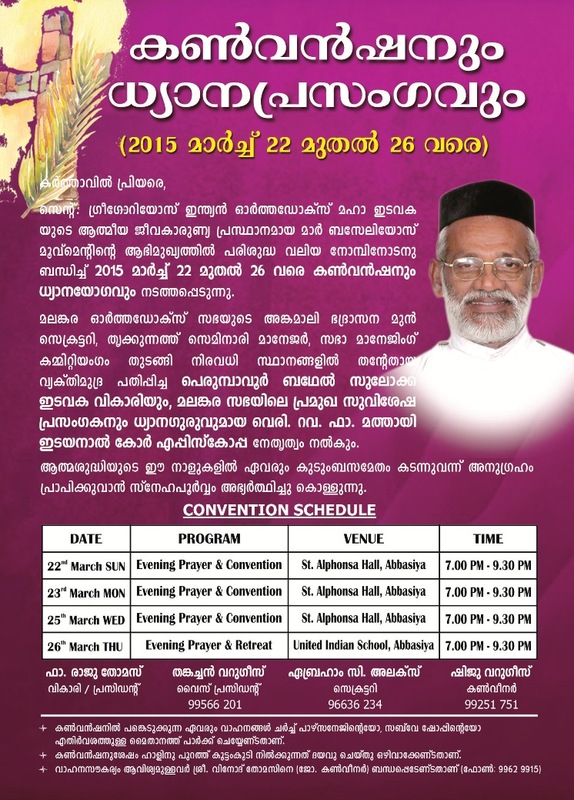 Mar Baselios Movement is organizing its annual Convention and Retreat from 22nd March Sunday to 26th March Thursday. Which will be led by Very Rev. Fr. 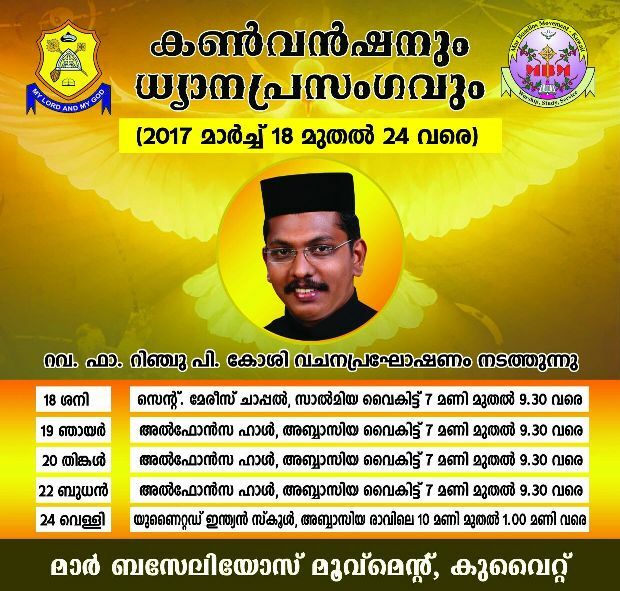 Mathai Edayanal from Perumbavoor Bethel Suluko Church, Angamaly Diocese. 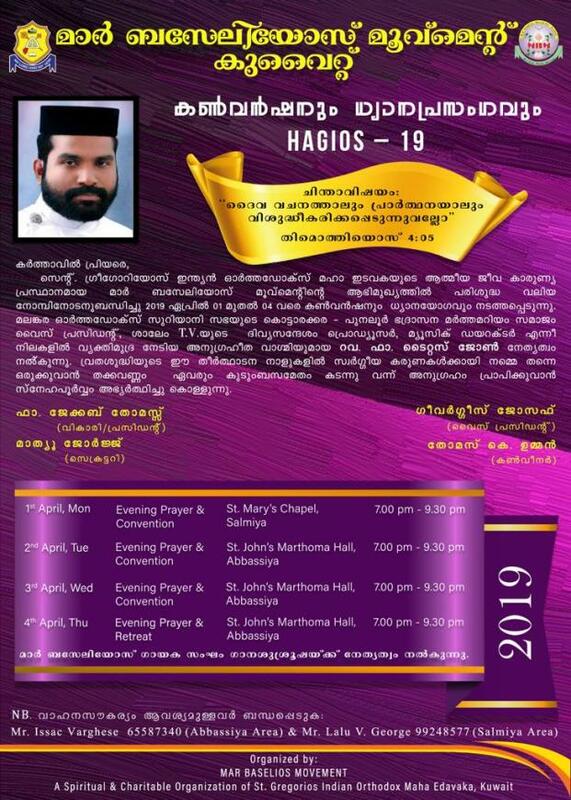 All are kindly requested to attend and get blessed. 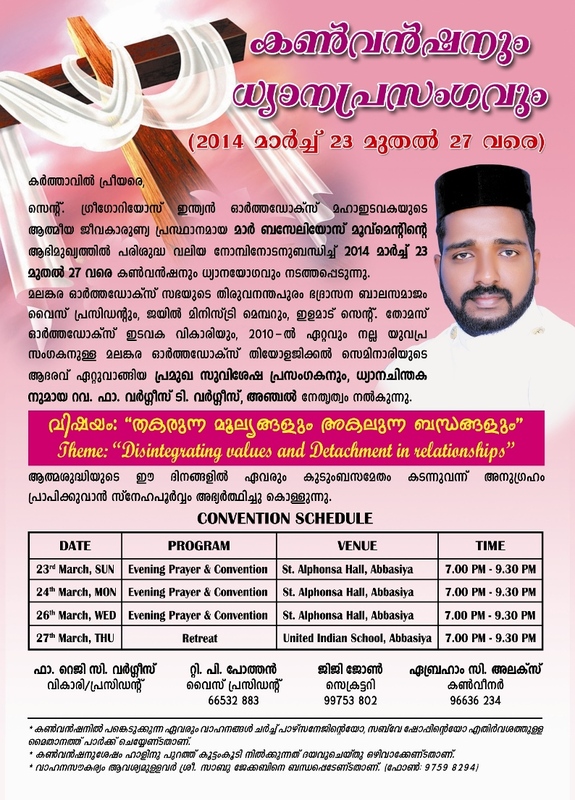 Mar Baselios Movement is organizing its Annual Convention and Retreat from Sunday 23rd March to Thursday 27th March 2014. Retreat and Convention Led by famous convention speaker Rev. Fr. Varghese T Varghese, Anchal. MBM cordially invites all Parish members to attend the Convention and Retreat and get blessed. Mar Baselios Movement�s 40th Anniversary and 50th Orma Perunnal of MBM�s Patron Saint His Holiness Baselios Geevarghese II Bava (3rd Catholicos & Malankara Metropolitan of MOSC) will be celebrated on Friday, 3rd January 2014. Holy Mooninmel Qurbana and Nercha vilambu will be at NECK on 3rd January 2014. 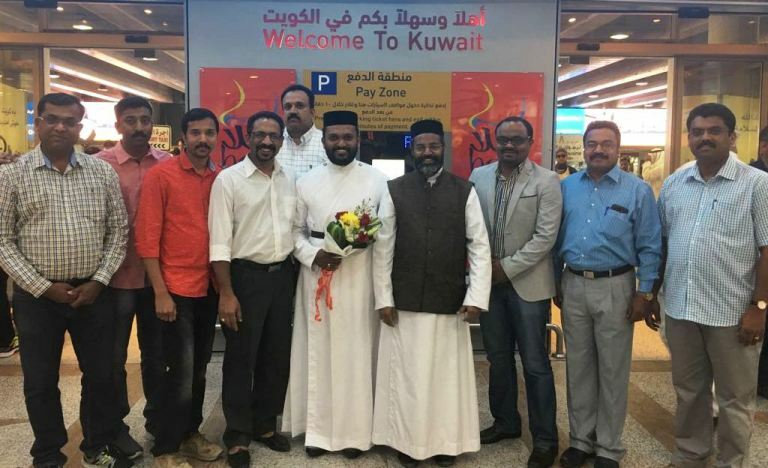 On this auspicious occasion, Mar Baselios Movement, Kuwait dedicates a Kidney Dialysis project to the Malankara Orthodox Syrian Church Medical Mission. MBM endeavour to provide free or subsidised dialysis facilities to the rural people of Malabar. We are fortunate enough to be associated with the St. George Charitable Dialysis Centre Puthuppadi, Calicut under the Malankara Orthodox Syrian Church Medical Mission (MOSCMM) established under the leadership of H.H. Baselios Marthoma DidymusI Valiya Bava and H.G. 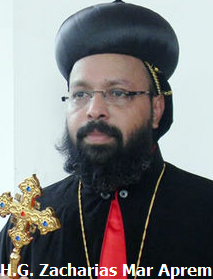 Dr. Zachariah Mar Theophilos, Metropolitan of Malabar Diocese. MBM cordially invites all parishioners to the 50th memorial service of H.H. 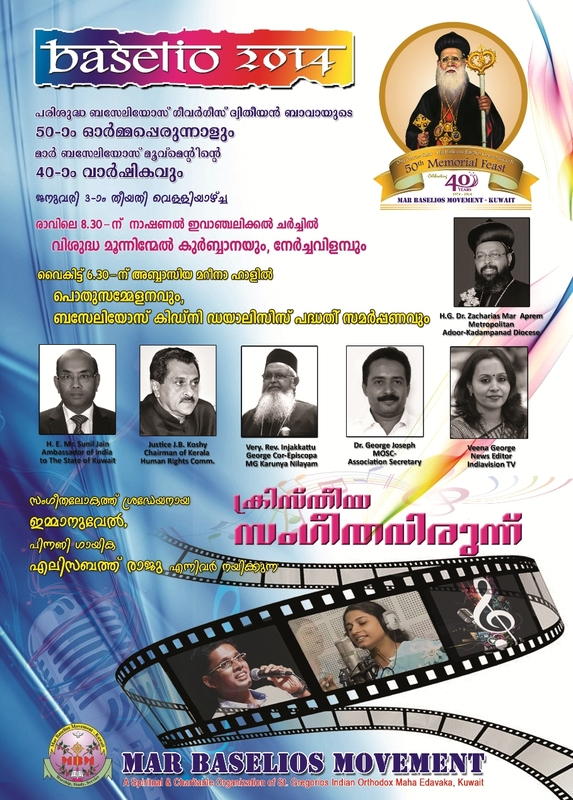 Baselios Geevarghese II Bava at NECK on Friday 3rd January at 8.00 am and to the Public function in association with the MBM 40th anniversary at Marina Hall, Jleeb Al Shyoukh on the same day evening at 6:30 pm.